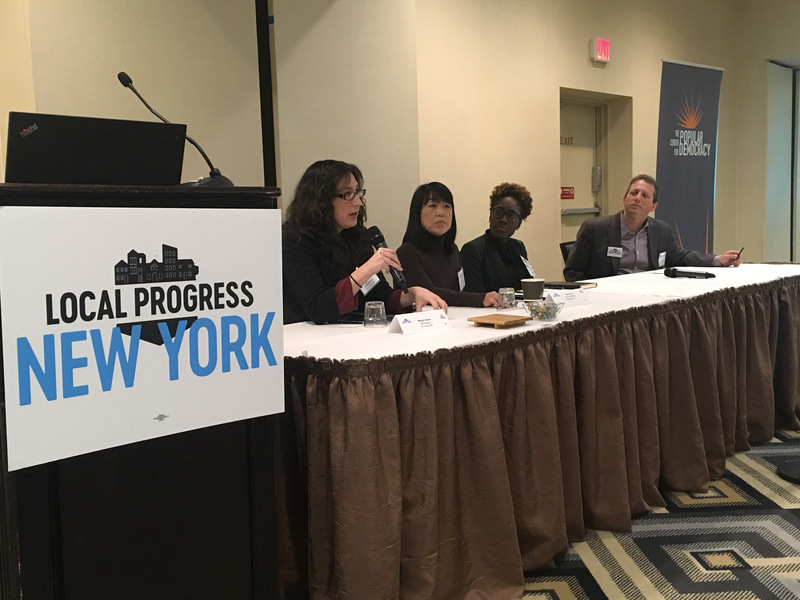 Last weekend, Local Progress members from around the Empire State descended upon Saratoga Springs, NY for the third annual Local Progress New York (LP NY) Convening. 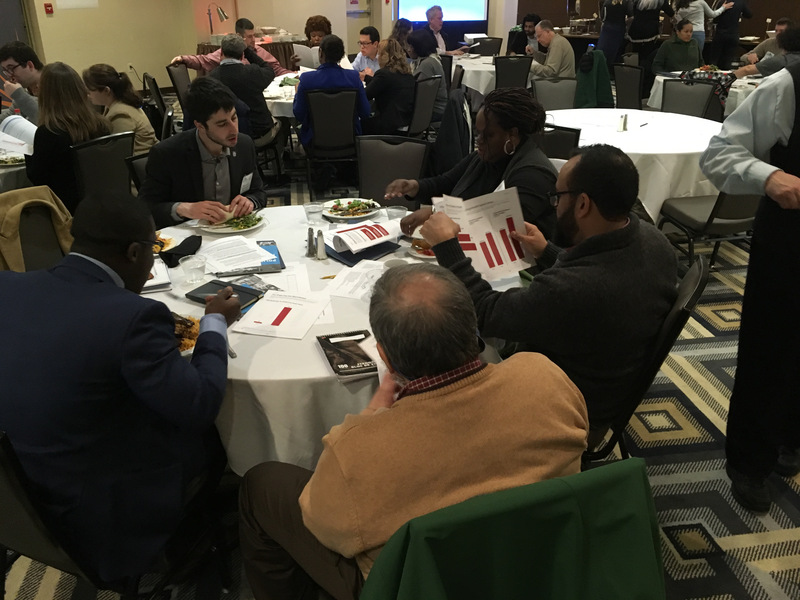 Despite a winter storm that dumped 32 inches of snow in parts of the state, progressive leaders from cities big and small came together to learn, train, and work together to ensure New York is a more equitable and just place to live. The event opened with Albany Common Council Member Dorcey Applyrs highlighting the dramatic growth of Local Progress New York which is now made up of over 150 members and is officially the first State Chapter of the national Local Progress network. Council Member Applyrs and the other eleven members of the Organizing Committee were integral to the planning of the convening and in leading the work of the chapter. Mayor Meg Kelly of Saratoga Springs gave a warm welcome and reminded everyone how localities can resist and lead in the fight for gun safety by announcing the cancellation of a long-standing gun show in her city. 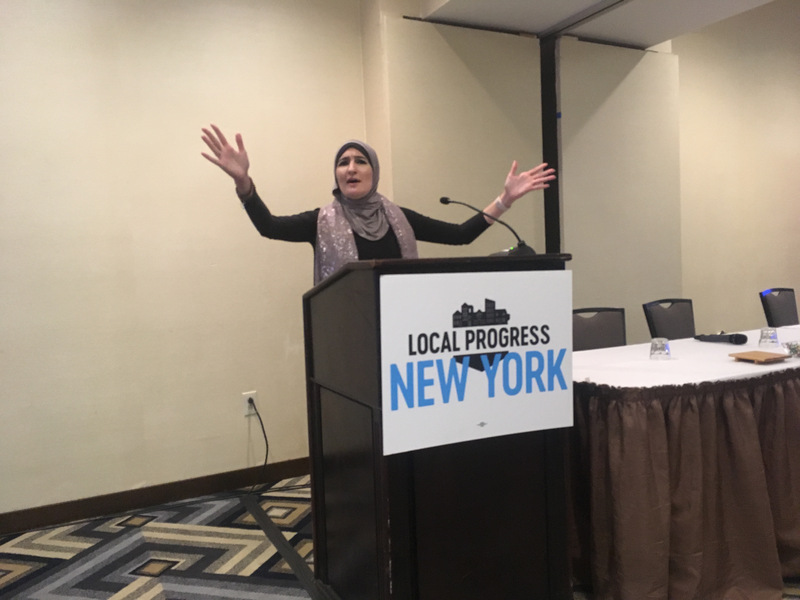 This year’s inspiring keynote address was given by national leader and activist Linda Sarsour, who gave a sobering, historic breakdown of the systemic policies that have attempted to suppress communities for generations. Her call to action to members was to be bold and brave in their local fights to resist the current actions coming from Washington. The following day, New York City Council Member Jumaane Williams spoke about how localities can effectively overcome decades of systemic racism and was followed by Local Progress founding board member Lea Webb and Council Member Brian Rowland from Prairie View, Texas, who presented a new tool to encourage community conversations about racial equity. Some of the topics discussed in break out sessions were just policing, protecting immigrants, affordable housing and more. Members were trained in racial justice deliberation, fighting runaway inequality, communications, and social media strategy. In the opening plenary, New York City Council Member Brad Landerwas joined by fellow Local Progress board members, Philadelphia Council Member Helen Gym, St. Louis Alderwoman Megan Green and Local Progress Texas Coordinator Mercedes Fulbright to discuss the enormous impact and growth of the Local Progress network across the nation. When LP NY members were asked to share victories from the last year, many of the victories or initiatives that people shared focused on policing, immigrant protections, and criminal justice reform – including Mayor Steve Noble announcing that Kingston would follow Albany in introducing the Right to Know Act. Paid Sick Days – There is a great opportunity this year to advance pro-worker reforms that would provide sick time for all workers regardless of the industry they work in. Local Progress members are currently working to pass paid sick days policies in Westchester and Albany counties. These policies will help thousands of workers across our state, and create momentum for more cities and counties across New York (and the country) to follow their lead. Let NY Vote – Let NY Vote is a statewide coalition of grassroots groups and legacy organizations working together to modernize New York’s voting laws. The mission is to ensure that common-sense solutions are passed to protect and expand the freedom to vote for every eligible New Yorker. These voting reforms include early voting, automatic voter registration, and allowing New Yorkers more flexibility when changing parties. Local Progress New York’s Organizing Committee: County Legislator Francena Amparo (Dutchess) Council Member Dorcey Applyrs (Albany), County Legislator Catherine Borgia (Westchester), Council Member Valerie Cartright (Brookhaven), Council Member Molly Clifford (Rochester), County Legislator Anna Kelles (Tompkins), School Board Member Jennifer Mecozzi (Buffalo), Council Member Karen Mejia (Newburgh), Trustee Carmen Piñeyro (Freeport), Council Member Marion Porterfield (Schenectady), Mayor Brian Pugh (Croton) and Mayor Tom Roach (White Plains). This year’s Local Progress New York Convening was made possible thanks to the generous support of the New World Foundation, Ford Foundation, Long Island Community Foundation, and Robert Sterling Clark Foundation.